Gloucester's medieval inhabitants may have had as much trouble distinguishing the many churches dedicated to St Mary as we might have. 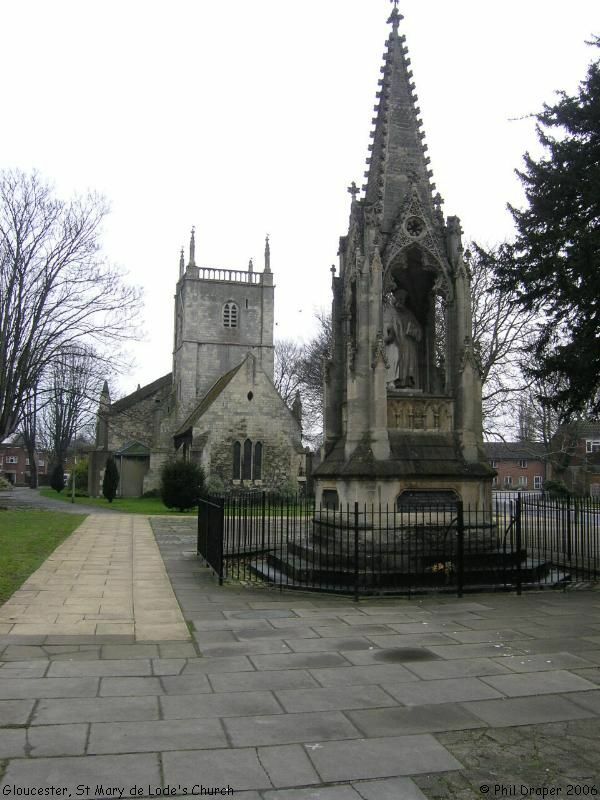 This one has also been known as "St Mary before the Gate of St Peter", "St Mary de Port", in the Middle Ages as "St Mary before the Abbey Gate", and in the 16th century "St Mary Broad Gate". 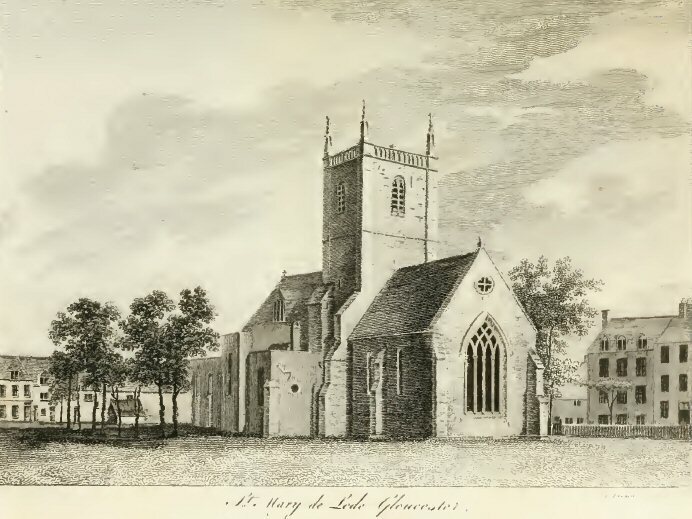 It is believed to be the oldest parish church in Gloucester, with its foundations as a holy place dating back to the early 2nd century, when it is thought to have been the burial site of the legendary King Lucius, King of the Druids, who became a Christian. His conversion, according to the Venerable Bede, was in AD 105, whilst Robert of Gloucester's Chronicle states that he died in Gloucester 4 years after this. 'Lode' in Old English refers to the ford or lode that crossed the River Severn, which in those days ran near the west door of the church. Excavations in 1978 and 1979 revealed that the church is built over two substantial Roman buildings of 2nd-4th and 5th-6th centuries. The second Roman building appeared to have been deliberately levelled to make way for a timber building which contained burials in the Christian manner and may therefore have been either a church or a Christian mausoleum. Above this building lay the floors of the 9th or 10th century Saxon nave. Outside the west end, before a stone annexe was added to the nave, was a cemetery which appeared to have been in use for about 250 years. When the Saxon nave was demolished in the late 11th or early 12th century, the walls of the western annexe were incorporated into an aisle-less Norman nave. North and South aisles were added in the mid 12th century. The Gloucester Journal of 22nd August 1825 gives a description of the beautiful tessellated Roman pavement that had been discovered in the churchyard about 5 feet below the surface, and states that the church walls were built upon it. 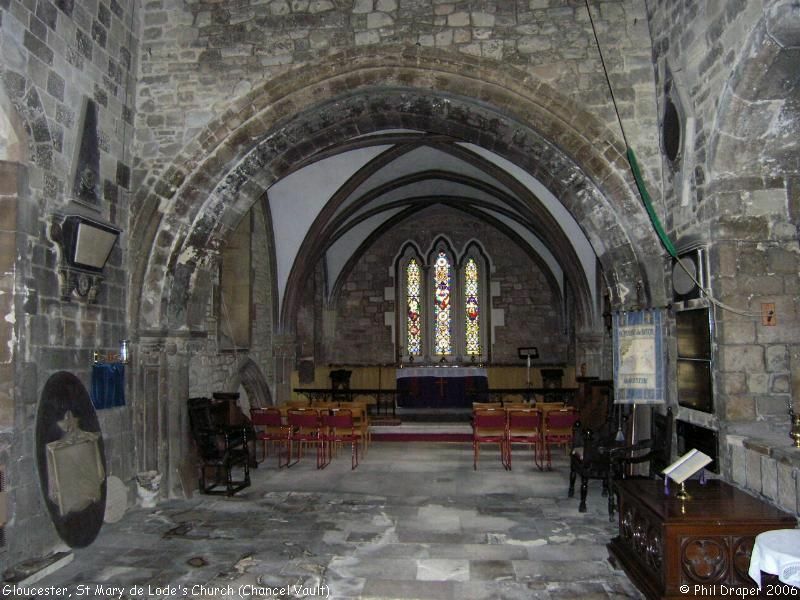 When St Mary de Lode was first recorded in the mid-12th century, it was subject to Gloucester Abbey. Its parish later included Tuffley, a large part of Barton Street and Wotton, with parts of Kingsholm, Longford, and Twigworth, and it was the mother church for the churches of Barnwood, Maisemore, and Upton St Leonards. 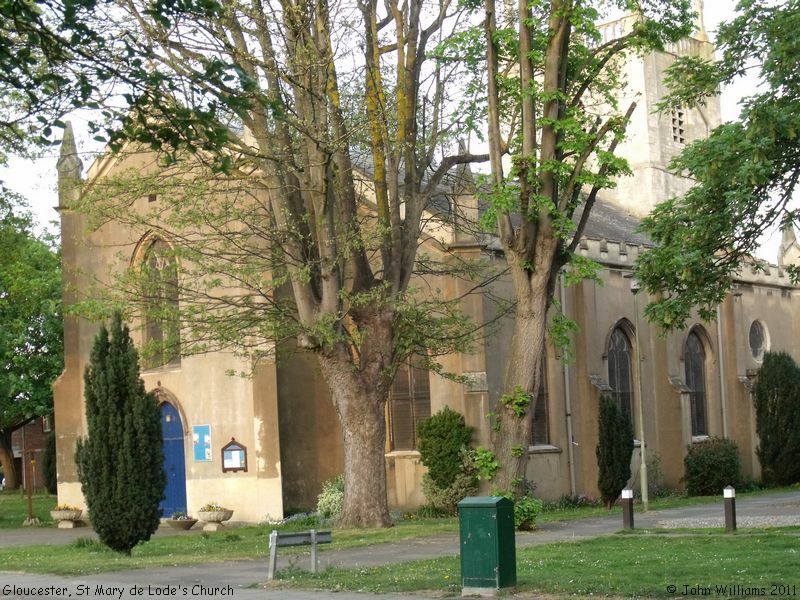 There is a story that it has one of St Lawrence's Church Barnwood's bells, though according to the A Ringer's Guide to Towers in Gloucestershire bell-ringing is rare, since the tower is close to residential buildings, and "there is no sound control". 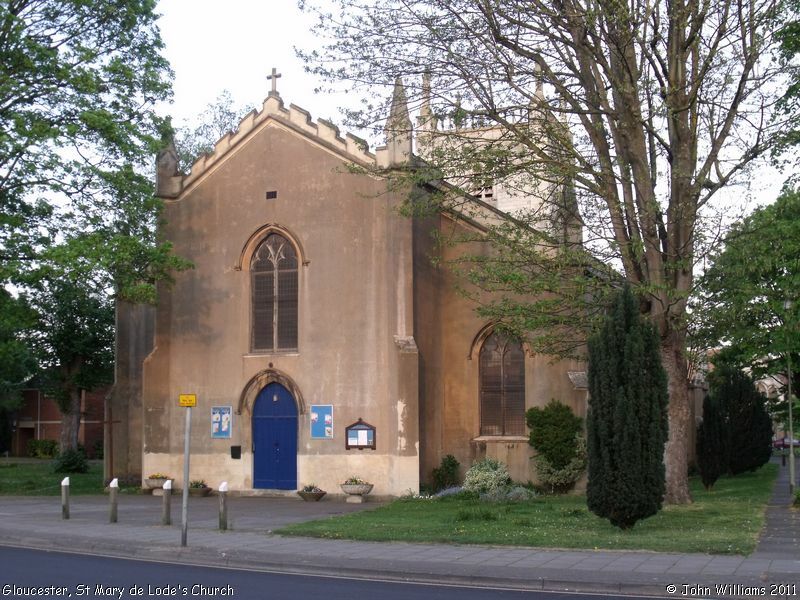 During the Siege of Gloucester in 1643, in the Civil War, St Mary de Lode was used as a prison for the Royalist soldiers captured at Barbers Bridge and Cirencester. 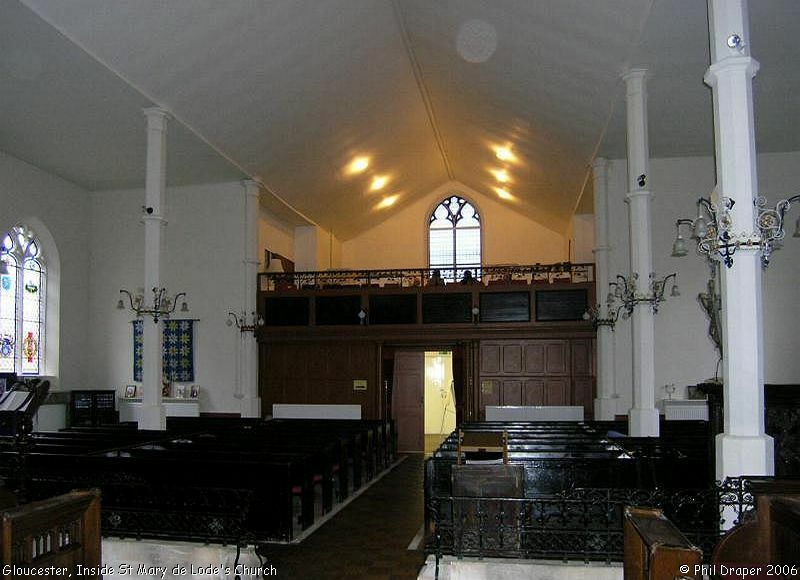 Records appear to show that there was no vicar between 1641 and 1660. St Mary de Lode's Church, Gloucester shown on a Google Map. Information last updated on 11 Sep 2011 at 15:02. Please also remember that whilst the above account may suggest that St Mary de Lode's Church remains open and accessible, this may not remain so. This Report was created 28 Mar 2019 - 22:20:31 GMT from information held in the Gloucestershire section of the Places of Worship Database. This was last updated on 7 Feb 2019 at 07:45.